Two months ago I came across an SBT office in Harare Zimbabwe and thought I should walk in and find out what they offering us as Zimbabweans. I was welcomed in a warm way. I had not planned to buy a vehicle but the time I left the office I had already found myself having identified a car I wanted to buy. 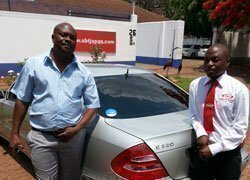 I was assisted to go through all the Mercedes Benz that SBT had in stock through all this I fell in love with the vehicle I ended up paying for. I will definitely import from SBT again because of their efficiency and customer care.